THE first airplane to get off the ground back in 1903 was flown by a prone pilot. Originated by the Wright Brothers, the prone pilot position was soon abandoned in favor of the upright seat and was to all intents and purposes a dead issue until the mid-30’s. Then the Germans revived the idea in their search for better sailplane performance. During the second World War the Germans again experimented with the prone pilot position—this time in some of the jet fighters they were developing and demonstrating to an astonished world. They also experimented with the supine position in which the pilot lies on his back—but that’s another story. The advantages of the prone pilot position are as obvious as they are limited. A much smaller airframe is possible with the pilot lying down instead of seated but this advantage would be useful only in military, racing or aerobatic aircraft, equipped with very small jet engines not yet in production. Several such small engines are on the way and once they are actually in production it is more than likely that the prone pilot position will become an important issue. For aerobatics the prone position is tops and in the prone position the pilot is much less vulnerable to the stresses of supersonic flight. The seated pilot blacks out long before the prone pilot. My own design for the small delta-wing fighter or racer, as illustrated, would have an ejection pod (possibly pressurized, containing the pilot), which could be parachuted to earth. Conventional tricycle landing gear would be reversed with the two main wheels retracting inwards into the leading edge roots and the tail wheel retracting into the fuselage section between the jet ducts. Is anyone else’s neck hurting? 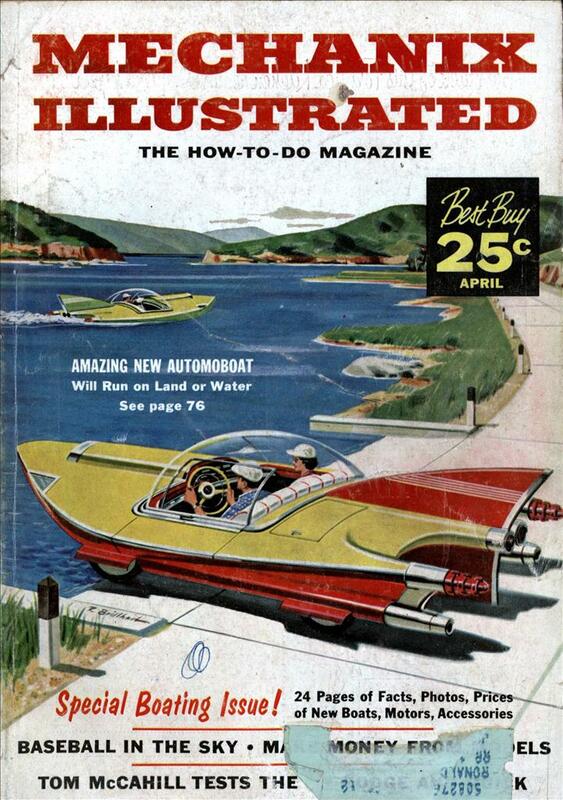 The comic Magnus: Robot Fighter 4,000 A.D. depicted people using flying cars, some of which were operated from the prone position. Could this article have been the inspiration? 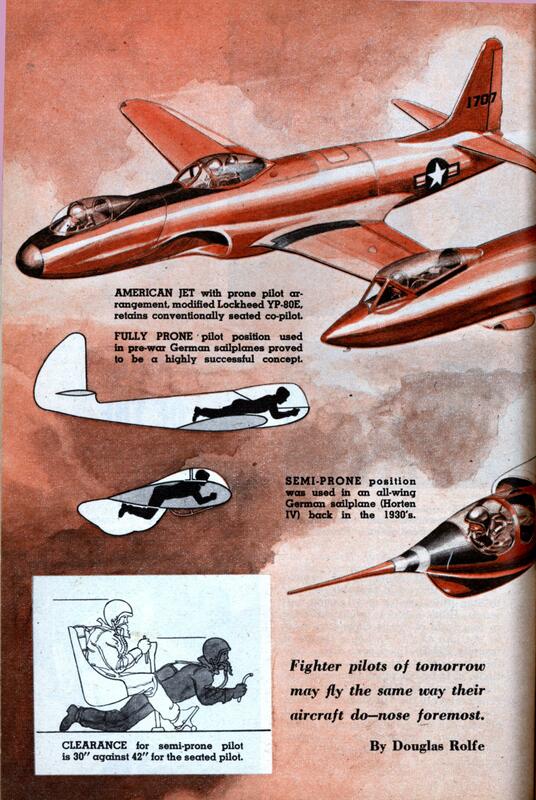 Northrop actually built an aircraft, the XP-79, where the pilot lay prone. Good link regardless. It’s amazing how this was supposed to cut pieces off of enemy aircraft. Tracey B: I think the picture in your link actually shows the pilot in traction after he’s flown a 12 hour flight in the prone position. To what degree is it necessary for the pilot to see the runway when landing? I suppose there could be windows not shown in the illustrations. Most fighters only have about a two hour fuel supply; it’s rather doubtful he’ll need traction after the flight. I agree that the pictures in the article would have a terrible blind area for approach and landing. (But what do illustrators know?) The nose of the Northrop plane was all glass or plexiglas. Some competition sailplanes/gliders had the pilot lie on his back, with his feet in the nose. F-14 with TARPS (Tactical Airborne Reconnaissance Pod System) had a 3 hour endurance. Scott B.: No I’m not into that. Too few people take into account that we’ll probably be laughed at fifty to sixty years from now by folks with 20/20 hindsight. to laugh at those wacky 2000-2009ers! The Daily Show is in no danger of shutting down. jayessell: That wasn’t my point at all. I think the last time I watched the Daily Show was to catch AJ Jacobs and I had to endure an appearance by that bloated waste of space Michael Moore. Firebrand, jay – I actually come here because I’m fascinated and often awed with science, technology and design from the ’20s – ’60s. But I’m not above poking a little fun where I can. And believe me, I also enjoy looking at the dumb junk of today and wondering what Future People will think of it. It’s like when my son wanted to grow his hair long — like we all did in the ’70s — rather than protest, I’m just taking lots of pictures, knowing we’ll all have a big head-shaking laugh in a decade or so. According to what it seems to have been read by me somewhere, the famous Leduc ramjet airplanes carried their pilots riding them in a prone position. Please correct me if I’m wrong.